It is the early 1960s, and Chicago is teeming with the tensions of the day—segregation, sexual experimentation, the Cold War and Vietnam—but it is also home to some of the country’s most influential jazz. Naomi Hill, a singer at the Blue Angel club, has been poised on the brink of stardom for nearly ten years. But when her big break, the cover of Look magazine, finally arrives, it carries with it an enormous personal cost. Sensual and magnetic, Naomi is a fiercely ambitious yet self-destructive woman whose charms tend to hurt those around her, and no one knows this better than her daughter, Sophia. As the only child of a single mother growing up in an adult world, Sophia is wise beyond her years, a casualty of her mother’s desperate struggle for fame and adoration. Unsettled by her home life, she harbors a terrible fear that her world could disappear at any moment, and compulsively maintains a list of everyday objects she might need to reinvent should nuclear catastrophe strike. Her only constant is the colorful and unconventional family that surrounds her and her mother, particularly the photographer, Jim, who is Sophia’s best friend, surrogate father, and protector—but Jim is also deeply in love with Naomi. 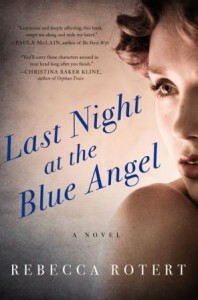 Weaving between the perspectives of Sophia and Naomi, Last Night at the Blue Angel is a poignant and unforgettable story about what happens when our passion for the life we want is at sharp odds with the life we have. Part stylish period piece, part heartbreaking family drama, it’s a novel rife with revelations, a vivid and propulsive page-turner—and the major debut of an extraordinary new writer. I mostly try to stay away from historical fiction, but when this book was pitched to me I liked the fact that at its’ heart it was about a mother and daughter. The story was rich, and good in so many ways, but it fell flat in others and actually in some parts really disappointed me. This tale is told from the two main characters’ points of view, ten years apart. Naomi is 17 years old in 1955, when she leaves her country home in Kansas to eventually make her way to Chicago, where through a series of her friends’ connections she ends up becoming a spectacular lounge singer. Ten years later, her daughter Sophia tells her side, of living with a mother who seems to be on the precipice of fame and leaving her daughter to fend for herself. Though I enjoyed both girls’ chapters, Sophia’s were the most real and heartbreaking for me. Her thoughts are earnest, with all her feelings laid out bare and nothing held back; because she is so young she doesn’t really see the need to keep secrets. Sophia is scared of loss, and since it’s the 1960’s her biggest fear (at least the one she states) is that everything in the world will be destroyed in a nuclear holocaust. This is a rather troubling thing for a 10 year old to be concerned about, but the reader quickly gets the sense that young Sophia may be more grown up than even her mother. People come and go out of Naomi and Sophia’s lives, and it’s fascinating to watch how each one affects both of them. The girls do have a support system, an “adopted” family of friends who have been there through thick and thin. Jim is the closest friend they have, although his love for Naomi far exceeds what she feels for him. It’s painful to see them interact sometimes, but Jim makes his own choices and he’ll take what he can get from her. The book is a fast read, but to me there were certain parts that dragged on far longer than they should have, and others I would have liked to see described in more detail. How Naomi got to be where she was is important background information, but I would have liked to see more about Sophia’s childhood and how she was treated by her mother during her first years of life. As I said, there were things about the story that disappointed me, and for the most part, that would be the ending. Two terrible things happened to Sophia in a very short amount of time, and I was left wondering if she was going to be alright. Yes, she is a strong little girl, but who knows what kind of effect the tragedies will have on a girl of such an impressionable age? Another thing I found odd was that Naomi just so happened to become lifelong friends with the first few people she met in Chicago. It was all very unrealistic, and seemed kind of forced and did not fit in with the rest of the story. I did like the book overall and would recommend it to those who regularly read stories from this period in time. Posted on July 4, 2014, in book tour, books, reading, review. Bookmark the permalink. 4 Comments.